Today i will be continueing my series on the costumes and embroideries of Halychyna. I will still be focused on L'viw Oblast. There are in fact, some counties that i have little to no informantion on. I would be glad to recieve any information that anyone might have. 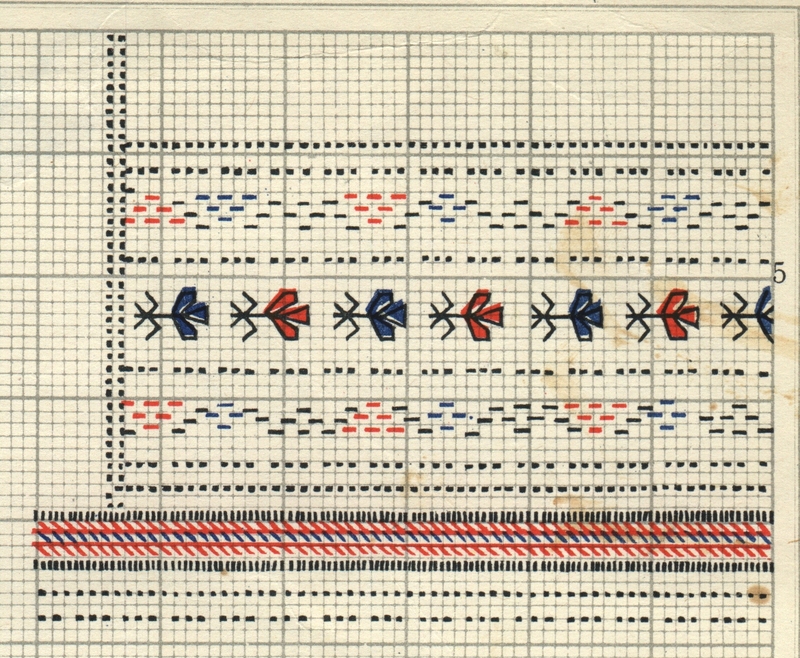 Today I will be presenting some old embroideries from Zhowkva, previously Nesteriw, and Rava Rusa counties. Here is our map of L'viw Oblast again for orientation. The only source i have for this material is Krawchuk. I would dearly love to get a grant and be able to go around western Ukraine/southeastern Poland, and visit the small local museums and document their material. Dreams. This is likely some of the oldest types of embroidery found in the area. Very simple, based on holbein stitch, running stitch, buttonhole stitch, etc. Elaboration of the same stitches used to construct clothing. I will start with a few examples from Zhowkva county. Here is the inset [ustawka of a woman's chemise. you can see the outline of the ustawka at the top, with two rows of running stitch around the edge. then some herringbone, overcast [blanket] stitch and running stitch on the top of the sleeve. Embroidery likely developed from this desire to strenthen seams. Here is an example of a collar from this county. 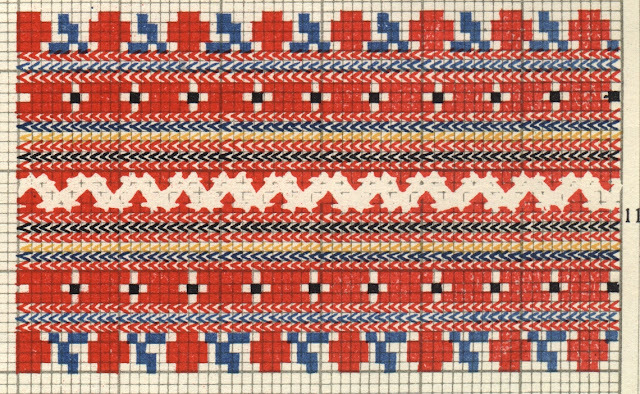 Some travelers in the 19th century reported that some villages had a rich embroidery tradition, and others had none at all. Here is an example of a simple yet elegant tradition that we have at least some record of. 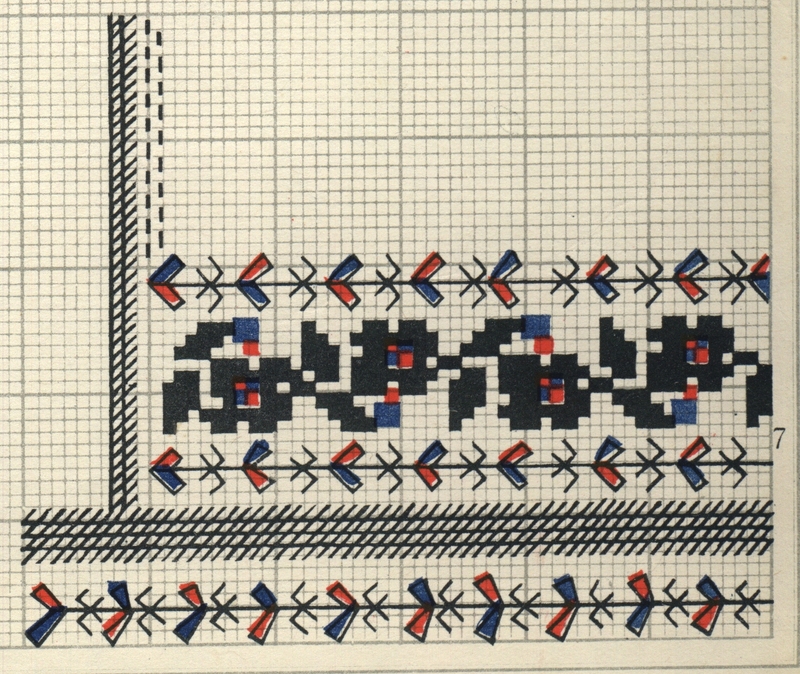 Some of the designs included some simple cross stitch, like this one. This again is the ustawka of a woman's chemise, you can see the outline, and the top of the sleeve at the bottom. One more example of a collar. The lines of double running stitch are sewn on to strengthen the collar, and here they form a frame for the embroidery. 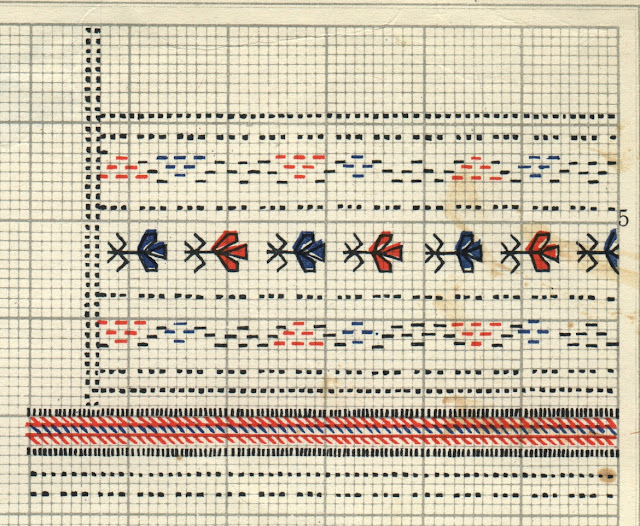 And one design from a different source, confirming the general nature of the embroidery of this region. If we go north a bit to Rava Rusa, we encounter very different embroidery. 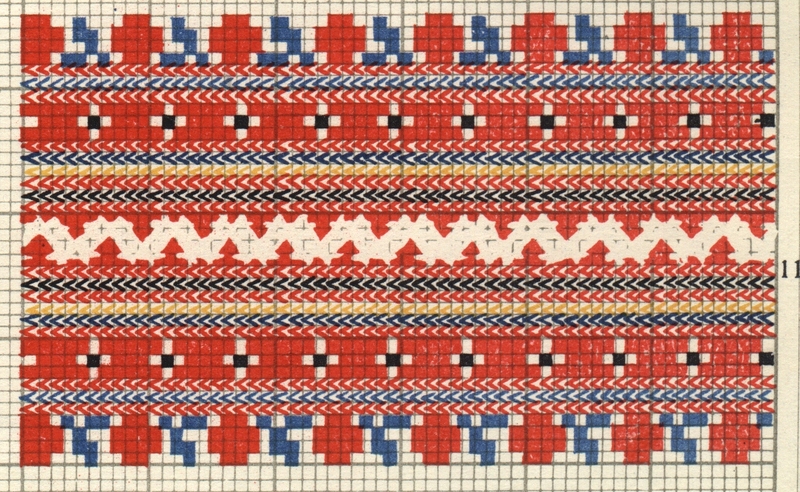 One type is done in zavolikannia stitch, where the thread is run over and under the length of the embroidery, imitating a woven design. We encountered this in Horodok county and others as well. It is executed like this. Unfortunately, all of the examples given are simple labelled 'fragment of embroidery', so i have no idea what they were used on. I suspect whoever collected them just cut the embroidery out, a despicalble habit that was all too common among those who went around collecting. So all that the museum has is a scrap of linen with embroidery on it, usually not even edge stitched or hemmed. But at least we have examples of this embroidery. Here is a very simple one. ﻿As you can see, this was done in mostly red stitching, with just a touch of blue or black. 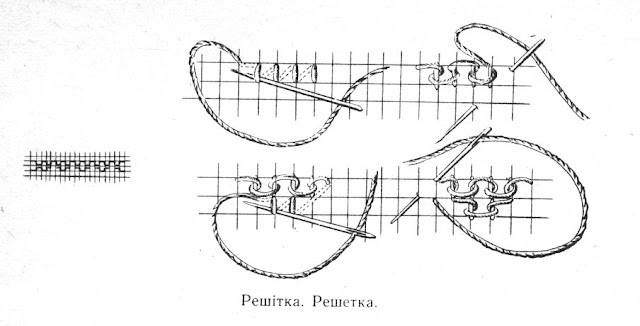 This type of stitching is also done in Polissia, where they have developed different designs. A couple more examples. I have not yet tried to duplicate these, but i think i should, just to be able to do it. They have a particular simple attractiveness of their own, owing to the texture due to repetition. There is another style of embroidery that was done in the villages of this area, apparantly only on the collars of men's and boy's shirts. I have not yet figured out how some of them were stitched. Here is one example which is reminiscent of Javoriw work. 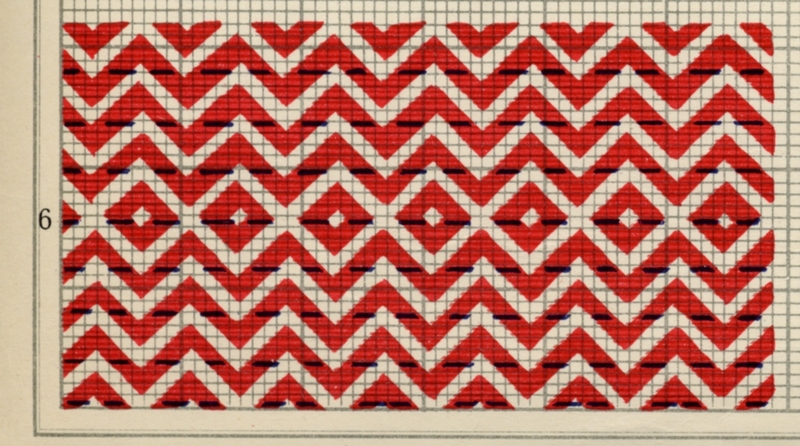 Cross stitch, herringbone, and flat stitching. Here is a similar one, with the addition of reshetiwka, or poverkhnytsia added in the middle, It was apparantly done in white, and is only visible as an erasure of the other colors and of the grid. Here is a schematic as to how you do this stitch. There is one row in the center of the design, apparantly worked on the diagonal. I will have to try this to see if i can replicate it. It would be much easier to see a photograph. There is one more type of embroidery in this group, which the text says was done in 'poza holku' which is the term used for herringbone, or any stitch where the needle comes out next to the previous stitch, such as stem stitch or some flat stitching. Here is a graph. I am not sure i can figure out how it was done. If any of you can replicate it, I would love to see it. It would have to be done very fine. Here is a challenge for you. Thank you all again for reading. These are relatively unknown types of embroidery, but they are also part of our history. Thank you, thank you for your exquisite blog! I am glad you appreciate it. I enjoy doing this quite a bit and am always glad to hear from people who appreciate the subject as much as i do. I found a shirt that was my grandfather's. It has embroidery and an offset neckline with buttons. Sash made of cord. Your website is very informative.